The closing date for online entries is 8th February 2013 at 7.30am. Note: entry via text / phone will cost +£1.50! It’s a big prize draw and the competition spans a few weeks – be sure to enter using the free itv.com competitions entry form…and do it six times to improve the odds of winning! A 14 night trip for the winner and five companions to the beautiful Maldives. The prize includes return flights from London Gatwick Airport to the Maldives, return seaplane transfers from the airport in the Maldives to the hotel and hotel accommodation at the 4T Thomson Platinum Vilamendhoo Island Resort and Spa based on the winner and their companions sharing three beach villas with double occupancy on an all inclusive basis. Please note that the winner will need a current and valid credit/debit card with sufficient available funds in order to check in at the hotel for security deposit purposes. The prize must be booked and taken up by 14 December 2013 and is subject to availability. Please note that both outbound and return flights must be booked at the same time, within one month of winner confirmation and are non-changeable. The prize is non-transferable and must be used by the winner and their companions. No cash prize alternative is available. A cheque for £20,000 made out in the name of the winner – spend it as you please! A MercedesBenz E220 CDI Sport Blue Efficiency Cabriolet with Leather Interior in Metallic Obsidian Black andincluding first registration fee and road tax for the first year. The Mercedes will be delivered to the winner’s home address within 3 months of receipt of all documentation from the winner. Such documentation includes without limitation a valid insurance cover note to register the car and current winners driver’s licence. The winner is responsible for insuring the car and all other costs associated with taking up the prize. The winner may choose to register the car in another person’s name subject to receipt of correct and valid documentation for that person. 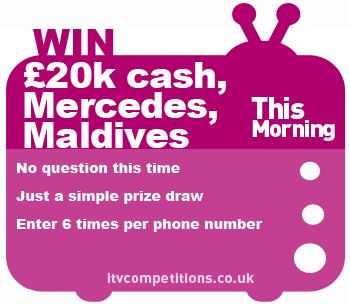 2013 kicks off to a roaring start with another great prize draw from ITVs This Morning TV show. Be sure to get your 6 entries in an maximise the chances of winning a cash prize, luxury holiday and lavish car! You never know; there always has to be a winner and this time it could be you!